Principles of Turfgrass Management, a certificate program from the University of Georgia and in partnership with the National Association of Landscape Professionals (NALP), expands your knowledge and professional growth. 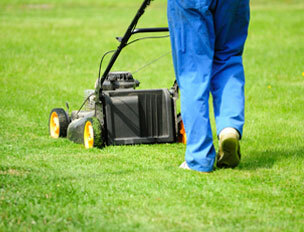 Whether you are new to the lawn care industry or you have years of experience, this program is for you. Upon course completion, you’ll gain new confidence in your skills and become Landscape Industry Certified by NALP. UGA offers online and print-based courses that give you the ability to study at your own pace to master up-to-date turfgrass management practices and procedures. The course covers the principles of warm- and cool-season turfgrass establishment, growth, maintenance, and troubleshooting. Enroll anytime. You have up to 12 months from your initial enrollment date to complete the course. A six-month extension can be granted for a nominal fee. You choose! Select the registration option below that fits your learning needs. Students who register for the online course receive access to the web-based course and materials, which include interactive practice quizzes and exercises. Students have the option of purchasing the printed text for an additional fee. Students who register for the distance learning course receive our renowned textbook, written and updated by master Turfgrass expert Dr. Keith Karnok. currently serving in, or retired from, a qualifying branch of the Armed Services and have a valid military ID Card. a veteran who receives VA benefits and has a valid Veteran Identification Card (VIC). a veteran who served honorably and who presents a valid Form DD214 or other proof of service. *In order to qualify for the group discounts, all participants must enroll at the same time. This course includes one attempt at each of two proctored exams. Students are responsible for locating a suitable facility and scheduling the exams. Students are responsible for paying any fees assessed by testing centers/proctors. If the student does not successfully complete the exam on the first attempt he/she may attempt the exam up to two more times. There will be an exam retake fee of $30 for each exam attempt after the first. Students who select the online version of the course may opt to purchase the print-based text book for an additional fee ($85 for U.S. or $135 for International – includes shipping and handling). Students who select the print-based version of the course and who live internationally must pay an additional $85 for shipping and handling fees. If a student is unable to complete the course within the twelve months allotted time, he/she may file for a six-month extension for a fee of $50. The Georgia Center will issue a refund less a $50 cancellation fee for course cancellation requests received before 5:00 p.m. on the seventh business day after receiving your materials. Business days are Monday through Friday, excluding holidays. We require that we receive your returned materials before issuing a refund. Please keep in mind that once you have accessed the online course, you are no longer eligible for a refund. To cancel your enrollment, please send an email to: student@georgiacenter.uga.edu. Students successfully completing all assignments earn 12 Continuing Education Units (CEUs) from The University of Georgia, with a transcript available upon request. Students earn the title "Landscape Industry Certified Lawn Care Manager" from NALP, and receive a certificate, patch, wallet card, and press release indicating their achievement.